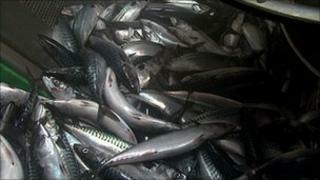 A Scottish fishing leader has urged the public not to be swayed by "doom mongers" over fish stock levels. Bertie Armstrong, chief executive of the Scottish Fishermen's Federation, warned "worst case statistics" were continually used. He was speaking ahead of Thursday's WWF "More Fish in the Sea" event at the Scottish Parliament. Fishing leaders recently warned cuts to the number of days vessels can put to sea threatened the fleet. Mr Armstrong said: "Thanks to innovation, commitment and real grinding sacrifice from the Scottish industry amongst others, remarkably good progress in the right direction has hallmarked the condition of our main target stocks. "However, the public have not been trusted with a balanced message, receiving instead a diet of excessive gloom using generalised global worst-case statistics. "This will serve only to paralyse people's opinions and generate an unwarranted presumption against fishing."